I’ve chosen to give Aiura a pretty neutral score because just one episode isn’t enough for me to form a very solid opinion- the episodes are only about five minutes long (including the theme song and credits). 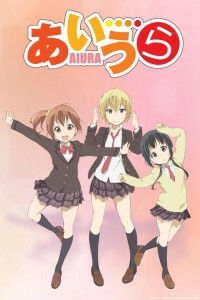 Not very much happened in the first five minutes of Aiura; all that is really revealed is that the main character is a girl who is about to start high school (and just that alone is pretty generic for an anime). I will say that the artwork is very beautiful, however – it’s shaded more than a typical anime and looks a lot like watercolor. It has a very illustrative feel, which makes me hope that the story itselfwill be very smooth, atmospheric, and interesting. The theme song has also sparked my curiosity…I wonder what all of the crabs in the opening animation are about. All in all, I will have to wait for a couple more episodes and see if it builds into something interesting. I am somewhat hopeful that it will, though.